Aging In San Diego: Christmas Lights Everywhere! Lit candles on the Christmas tree have been a tradition – and a fire hazard – since the 17th century, when Germans combined the Yule log and indoor evergreens in one combustible symbol. In America, these German traditions became American traditions, but until Thomas Edison came along, the dried greenery was still such a fire hazard that insurance companies refused to pay out for Christmas tree fires. In 1882, the Edison Electric Light Company came to the rescue with electric light bulbs that only occasionally caught trees on fire. Christmas tree lights hit the White House tree in 1895, and once electricity was in every house, our national love affair with Christmas lights began. There’s no better way to celebrate the season than for caregivers, friends and loved ones to see the lights of San Diego. This list, from San Diego Family Magazine, will take you to every over-the-top neighborhood light display in the county. They even made a map for you to download, so buckle up and enjoy! Fairway Village, east and west sides of Stoney Gate Pl. 80 homes decorated in “Holiday Magic”. Dec. 10-Jan.1, 5:30-10:30 pm. 2609 Meadowlark Ln. An inflatable world for Christmas with over 35 inflatables and 1,000 lights. Candy canes for kids on Fri. & Sat., 6-9 pm. Dec. 1-Jan. 1, 5-10 pm. Dec. 24-26, 9am-10pm. 12631 Stoutwood St. Off Twin Peaks Rd. & Deerwood St. Nicknamed “The Griswolds.” Dec. 1-Jan. 1, 5:30-10 pm weekdays, 11 pm weekends. Hickory Ct./Hickory St., 12659 Butterwood Ct. and Rockrose Ct. All off Twin Peaks Rd. & Silverset St. named “Candy Cane Courts.” Entire cul-de-sacs are lit up. Dec. 10-24, 6-9 pm. 23542 Bassett Way. “Happy Lights Ramona” with 30,000+ lights animated to music on 9 FM using 996 computer channels to control the lights. Nov. 24-Jan. 1; Sun-Th, 5:30-10 pm; and Fri & Sat, 5:30-11 pm. Oviedo St. Off Black Mountain Rd. “Christmas Card Lane.” Also enter off Twin Trails Dr. & Carmel Mountain Rd. Dec. 9-31, dusk-10 pm. 7607 Romeria St. Nicknamed “The Carlsbad Christmas House”. Walk up to see the animated window display, swimming penguins, surfing Santa, Snoopy skating and three snow machines. Food drive donations accepted. Dec. 4-31, 5-9 pm. 6646 Elegant Tern Pl. Real Santa’s mailbox for the kids and treats nightly. Santa writes back a free personalized letter to each child. Dec. 3-25, 5-10 pm. 1615 Quiet Hills Dr. Lights synchronized to over 10 songs on 9 FM. 2329 Snead Dr. Lights, lights, lights, Santa arrives by hot air balloon, nativity scene, animated elves and Santa village light display. Walk up to see a Christmas scene in the garage. Dec. 5-31, 5:30-9 pm. 1562 Peacock Blvd. Rudolph, Christmas trees and lights. Dec. 10-Jan. 5. 5:30-10 pm. Whitney St./Mankato. Circle between First and Second Ave. off H St. & 1st Ave. “Christmas Circle.” 59th year of decorating 55+ homes. Dec. 10-26, 5-10 pm. 2160 Reo Dr. 14th year of decorating. Nov. 21-Dec. 31, 7pm-midnight. The Forward House in Bankers Hill. Experience the sight and sounds of the season at 108 Ivy St. (1st & Ivy). Built in 1905 for Mayor John Forward Sr, adorned with lights every season since 1998. Nov. 24-Dec. 31, 5–10 pm. 3628 Alabama St. Nicely decorated home with lights and inflatables. Dec. 1-24, dusk-9 pm. Lana Dr. & Jamar. Off Mt. Abernathy Ave. Circular street. “Clairemont Christmas Park”. 40+ homes decorated. Dec. 1-24. 5404 Mt. Burnham Dr. Features a 96-channel animated light display to 5 FM. North Pole village display, train and animated figures display in garage. Dec. 12-31, 6-10 pm. 4210 E Overlook Dr. Nicely decorated home includes 4-ft snowmen, lights, an English phone booth, nutcrackers, life-size sleigh and non-toxic falling snow. Dec. 5-Jan. 5, dusk to 10 pm. 8866 Cassioepia Way. Decorated house with a Disney theme. Dec. 10-31, dusk-10 pm. 10780 Foxwood Rd. Decorated house with a Scooby Doo theme. Dec. 10-31, dusk-10 pm. 11505 Elbert Ct. Decorated house with a PAW Patrol theme. Dec. 10-31, dusk-10 pm. Stonebridge Parkway and Merritage Ct. Nicknamed “Merry-tage Court”, entire street lit up with fun themes. Dec. 1-31, 5:30-9:30 pm. 10927 Baroque Lane. A Winter wonderland with shooting star display, animated ski village, miniature village, snowmen and more. Dec. 9-28, 6-10 pm. Garrison St. & Chatsworth. Off Rosecrans. “Garrison Street Lights”. 1-31. dusk-10 pm. Sights and Sounds of Christmas. Walk the Temple grounds and enjoy more than 130,000 lights and nativity scenes. Free. Dec. 1-Jan. 1, 5-11 pm. San Diego Temple, 7474 Charmant Dr., UTC. Jingle Bell Hill (also known as Pepper Dr. Lights). Solomon Ave./Pegeen Pl. and surrounding area. Off 67 & Bradley. Dec. 7-26, Mon-Th, 6-9 pm, Fri-Sun, 6-10 pm. 11456 Pegeen Pl. “Nightmare Before Christmas” theme, complete with Jack, Sally, Zero, the Mayor & Oogie Boogie. Santa may make a surprise visit. Dec. 5-Jan. 1, Mon-Th, 6-9 pm and Fri-Sun, 6-10 pm. 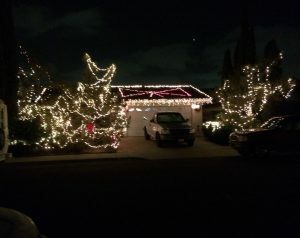 1838 El Pico Dr. Off Hacienda Dr. 53rd year decorating the 20-ft. star that’s 100 ft. up. Nov. 29-Dec. 31. Also see a 55-ft. train. Dec. 8-31, dusk-10 pm. 9777 Valley Ranch Rd. Cul-de-sac of lights programmed to 1 FM/87.9 FM. Giant dazzling trees, twinkling stars and a Winter Wonderland of computerized light and music shows. Nov. 28-Dec. 31, 5-10:30 pm. 1552 Cajon Greens Pl. Light-o-rama with a 20-ft. tree, thousands of lights, leaping arches, yard decorations, roof slopes of lights and video projector. Nov. 25-Jan. 2, Sun-Th, dusk-10 pm and Fri-Sat, dusk-midnight. 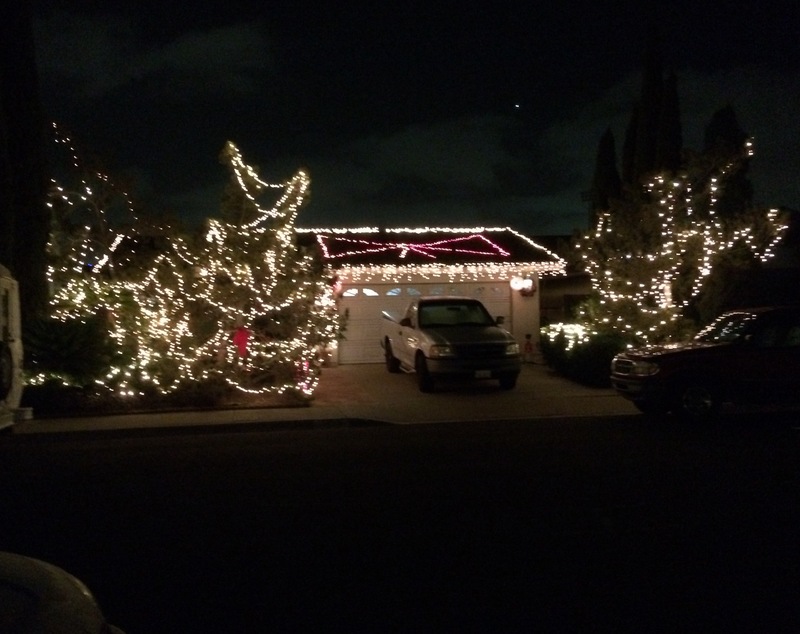 10248 Paseo Palmas Dr. 20+ houses nicknamed “Tinsel Town.” Dec. 5-25, 5:30-9 pm. 13518 Appaloosa Dr. 48 channels of lights dancing to 1 FM. Dec. 1-Jan. 1, 5-10 pm. 6266 De Camp Dr. 22-ft tree of light and more. Lights dance to Christmas songs. Dec. 1- 25, 5-9 pm. 9367 Urban Dr. Decorated with lots of lights and inflatables. Dec. 1-31, dusk-10 pm. 7817 Quince St. House lit up. Donations for Humane Society accepted. Dec. 6-31, dusk-10 pm. 8045 Stadler St. Inflatables matched with traditional illuminations. Dec. 1-24, dusk-10 pm. 689 Meadowbrook Dr. Off Jamacha Rd. South of Lemon Grove. Occasional sightings of Santa and Mrs. Claus. Dec. 8-Jan. 1, dusk-10 pm. 2618 Sheri Lane. Cul-de-sac turns into Santa Claus Lane. Light show at 6:30 pm and every 30 minutes on 89.9 FM. Dec. 1-31, 5:30-9:30 pm. Starlight Circle/Sunburst Santee. Tomel Court, off Magnolia. Many homes lit up. Dec. 17-26, dusk-10 pm. 9325 Pebble Beach Dr. Displays on house and yard set to music. Dec. 1-31, dusk-10 pm. 9435 Saint Andrews Dr. Santee’s gingerbread house with over 12,000 lights. Nov. 28-Jan. 1, dusk-10pm. 4037 N. Bonita St. Lots of lights, music and decorations. Dec. 15-Jan. 5, dusk-11 pm.